C'est ce que j'ai essayé de faire dans le scénario pour la VF des Grimtooth traps. Il est horriblement linéaire, mais plein de défis pour les joueurs. La plupart des pièges sont conçus pour tirer parti des défauts courant des joueurs et joueuses : s'ils foncent, ils risquent la mort. Mais chaque piège peut être détecté et il y a une solution. Au test, l'utilisation d'henchmen est intéressante : elle permet d'abuser sadiquement de la létalité des pièges, tout en préservant la possibilité pour les personnages de trouver la solution - et la sortie. Alors, pourquoi un jet de dés ? C'est la dernière chance une fois que le player'skill a échoué. Un arbitrage qui ne met pas en cause le jugement de l'arbitre ("tu joues comme une bille, je m'en lave les mains, jette un dé"). Mais en fait ce n'est pas obligatoire. Il y a des pièges qui ne laissent même pas l'opportunité d'un save. Tu tombes dans le piège, tu meurs. 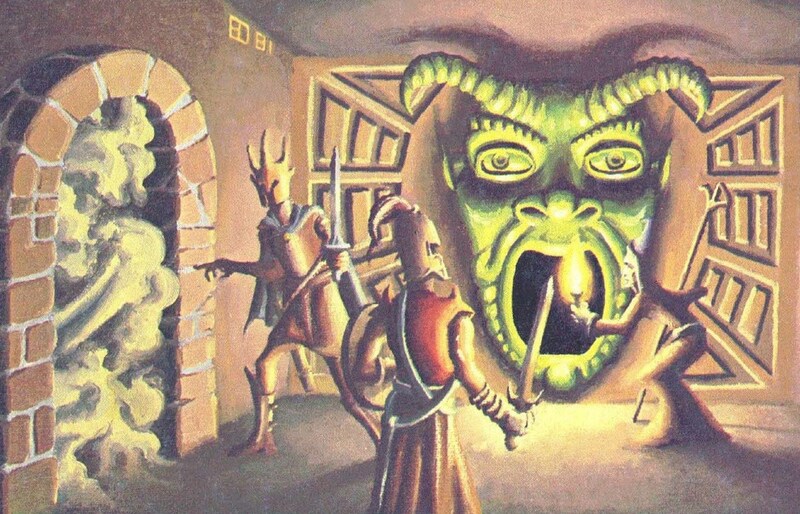 Un des pièges-sans-save le plus fameux est sans doute le green devil face de Tomb of Horrors. Faut quand meme sacrément manquer de player's skill pour rentrer là dedans juste pour voir, non ? Je suis complètement d'accord, et je pense que ça a été un des points de départ du schisme DD3.X / OSR. Pour le coup, ça me semble une illusion rétrospective liée au Primer de Finch. La lassitude face à l'inflation des dons, des stats blocs, des durées de combat, puis la déception face à DD4 et son attitude initiale vis à vis de la vieille garde, ont joué un bien plus grand rôle - ne serait-ce que parce qu'on peut parfaitement faire appel au player's skill en DD3. Et tu as raté le kickstarter de DCC Lankhmar ? Je ne l'ai pas raté; j'ai décodé de ne pas l'acheter. Je ne suis pas très jdr à licence et je préfère en général le jdr "inspiré de" qui propose son propre univers à une adaptation officielle. 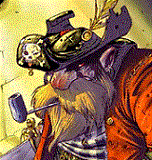 Et pour ce que je veux faire le côté foutraque et gonzo de Lankhmar et de DCC n'est pas du tout ce que je recherche. Crypt & Things, pas lu non plus mais semble avoir bonne réputation. Ah merci, j'avais oublié cette vidéo. je viens de la re-regarder et en effet on dirait que ça pourrait faire l'affaire. Low Fantasy gaming aussi, en fait. C'est probablement très bien (ACKS est très bien) mais, vu ce que j'ai appris depuis quelques temps sur l'auteur et son implication dans l'alt-right américaine, je ne pourrais pas justifier de lui donner de l'argent. Et non je ne veux pas lancer un débat sur la question. Bah voilà a cause de vous je viens de me commander en POD les 5 books de B/X essentials. Pffff. C'est leger, c'est agreable a lire comme format, le découpage en petits livrets va faciliter aussi en jeu la consultation par les joueurs. Seul truc peut etre, le livret ne reste pas ouvert sur une page quand posé a plat, faut mettre un truc dessus si tu veux garder ta page. Peut éventuellement etre un peu casse pied en jeu, a voir. Mais bon, pas de regrets. Sur le fond, mes premiers contacts avec l'ancetre c'etait AD&D2, le b/x est donc une decouverte, et bien je trouve la compilation très bien faite. C'est clair, ergonomique. J'aime bien aussi la note d'intention au debut de chaque livret. Bref, je suis conquis. Tu n'as pas pris la version agrafée ? Elle a été justement proposée pour pouvoir rester à plat sur la table. A noter qu'une partie des livres est disponible sur Lulu. 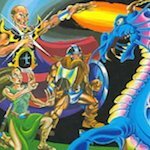 Un (très vieux) message passionnant d'un forumiste anglo-saxon concernant la pratique du D&D B/X et de l'old-school en règle générale. Rien de neuf mais une belle synthèse. Interesting thread. I am actively running a B/X Campaign that has been going on for months now, which began life as a one-shot 'B4 Lost City Marathon' inspired by the 'Caves of Chaos Marathon' described on the Troll & Flame blog. The folks liked it so much they just had to keep going, so we play once a month and now they are exploring the bottom half of the pyramid. Too many folks have this idea that a proper sandbox is all about an entire world of hexes with mysterious stuff in them and the players just sort of wander around until they stumble into adventure. You can do that, but we're talking a lot of work and a lot of players wandering aimlessly. Sandboxes are meant to be small. While they can take exist a larger setting, a proper sandbox should be 'focused' on a particular adventure, giving the players freedom while still maintaining structure. Gary showed the way here with the design of B2 and X1. Both were microcosms, little mini-sandboxes with defined borders that allowed players the freedom to explore, but with a tightly focused purpose. So, IMG, a Sandbox wouldn't be an entire world. A sandbox should be one hex in that world, maybe two or three if it is a multi-part adventure equivalent to two or three old style D&D modules. This is much easier on the DM and much less of an exercise in pointless meandering for the players. And let's not forget the Megadungeon concept here. A good Mega-Dungeon is a type of sandbox, but one that goes up and down rather than side by side. Some of the first dungeons were so big, taking characters from 1st level to the heights of power, that they made the typical sandbox look tiny in comparison, but they are much more focused, and linear, so the players wanderings will always lead them to more adventure. Now, a lot of folks have discussed getting the players into the action through their finding plot hooks, typically through the act of picking up bits of gossip in a bar. To me, depending on that to get them to the adventure site is one step too far. I say just drop them into it with a general idea of what's going on and then let them buy rumours and so on as a means of gathering further info about the adventure, not to get to the adventure itself. Again, B2 is a good example. The players are there at the beginning of the adventure. They don't hear about the place and spend off-camera time traveling there. They're just there, feet in the sandbox and ready to roll. Give them a general idea of what's going on, i.e. 'you're here to help hold back the hordes of chaos and earn a little coin in the process' and let them build relationships, explore rumours, etc. that are all focused on defeating the hordes instead of spending precious game time with them futzing about a hundred miles away trying to figure out that there's an adventure to be had in the first place (and then having to make an interminable number of wandering monster checks that might kill them before they even get there). This focus keeps even the false rumours useful, BTW, as sending them off to the wrong portion of the sandbox doesn't put them out of the adventure entirely. In fact, considering the small area involved in our 'mini-sandbox' it might lead them right to another encounter, as it often does in B2, with madmen living in trees, chaos scouting parties, etc. Some of the most exciting moments in my B/X games comes from simple events related to resource loss. In my B2 game, the players placed the torchbearer at the back as they fought the hobgoblins to their front, not realizing there was a secret door behind them, through which the poor torchbearer was dragged. The whole place went dark and the players rightfully panicked and then died flailing about in the dark against the Hobgoblins who had infravision. After a second loss of lighting sources to a torchbearer falling down a pit, they tend to spread the lighting sources about now. Another instance involved two of the players being randomly teleported around the dungeon by monster. Without a map, or any paper or writing materials, they had to wander around trying to regain their bearings. One of them ended up going in circles for some time before ending up in a room full of Shades that they had been avoiding all adventure long. By himself. With no magic weapons. It weren't pretty. Rarely has food or water been a problem for my parties, but never underestimate the dangers inherent in not eating and drinking. Not having these basic supplies keeps you from healing in my games and will eventually lose you more HP and start to force exhaustion checks. Suddenly, that two day trip back to the keep turns into a week and that means more wandering monster encounters, but in a weakened state. Once the players have experienced this, they'll make hard decisions about whether or not to 'ditch' their supplies in order to run faster. Most will decide that armour and gold are much better items to drop. Fear of the Dark, Fear of being lost, fear of deprivation, these are experiences that your players will understand on a very deep and visceral level. Use of them will really enhance the verisimilitude of your game. As such they are the basic building blocks of a B/X adventure, as important as exploration, and a DM should work encounters in that play on these basic fears. Just one large cave with a strong enough air flow to make torches go out will put your players on guard, even if there isn't an obvious monster in sight (and get them investing in proper lanterns, to boot), and they will fear a trip through a desert or across the sea without proper supplies. Hit Points are yet another resource to manage and there is nothing more terrifying than having to traipse back towards a dungeon entrance with practically no health. Except maybe having to hole up in a secluded spot in the dark and damp trying to avoid drawing any attention from things that might find you in your weakened state. And that's it, really. Fear of infirmity makes your HP a precious resources and one not to be squandered on pointless engagements with wandering monsters, which force you to stop and rest, which expends even more of your food, water and light and possibly attracts more wandering monsters, creating a situation where you have to leave and go back to town, facing more wandering monsters on the way and possibly finding rooms you have already cleared re-inhabited when you come back. It's a very tense balancing act, is dungeon exploration, but that's half of the fun. As an aside, this is why I love Level Drain and Save or Die effects. Undead are truly terrifying in old school D&D. As a player, I avoid them like the plague. And even the highest level fighter needs to fear a Medusa or the bite of a poisonous monster. The threat of bypassing even a high hit total keeps the game scary even into the higher levels. Rien de neuf mais une belle synthèse. Quand j'ai un peu de temps libre je dévore les sujets consacrés au B/X en ce moment : B/X essentials me donne envie de vraiment me plonger dans cette ambiance. B/X essentials me donne envie de vraiment me plonger dans cette ambiance. je comprends tout à fait ça. Pareil.